Aside from flexible workplace policy and procedures, you should also develop a strict policy for outside work. Once employees are already outside the work location and have already rendered the specified time frame where they are expected to provide their services to the business, the company already do not have a hold when it comes to the activities that the employees would like to participate in. However, damages incurred by these activities that can affect the business and its image can result in termination. This is the reason why there should be strict policies related to outside work. Most businesses are aware of the fact that their employees can actually be employed with other businesses especially if the work designation only requires part-time commitment. If an employee wants to have an additional job, having a strict policy about outside work can help the business protect its rights while keeping a healthy relationship with the employee. If you want to allow your employees to immerse in other activities that will give them extra income from other businesses, then it is highly suggested for you to come up with an employment policy related to outside engagements. Why is There a Need for a Strict Policy with Regards to Outside Work or Employment? Not all employees can handle working in two jobs simultaneously. Also, not all companies allow their employees to have two jobs at the same time. This process is just like working with two masters and it is most likely that one will be favored compared to the other. This is where the benefits of having an outside work policy come in. Listed below are some of the major reasons why it is essential for a strict policy with regards to outside employment to be created and implemented. A strict policy for outside work directly presents the rules of the business related to work performance, work week policy, loyalty and the like. Businesses have standards to meet. These standards may be hard to achieve on the part of employees especially if they are thinking of the other job that they still need to accomplish to satisfy the needs and demands of the other company as well. Lack of focus can have a negative toll on the performance of an employee and the outputs that he or she will come up with. A strict policy for outside work specifically discusses the parameters and limitations of outside work engagement. This ensures the business that all employees are aware of the regulations of the company with regards to certain matters involved in outside employment. A strict policy for outside work helps the business to gather a more productive and efficient workforce. Through a strict policy for outside work, businesses can make it a point that their demands specified in the employment contract are what should be prioritized by their employees. More so, this gives the business the ability to let the employees select which job to keep once termination is already necessary due to certain work-related and productivity issues. The failure of the employee to provide the expected deliverable as mentioned by the management and human resource department in relevance to his or her work designation. The unsatisfactory performance of the employee when it comes to customer services and the actual job that he or she is tasked to do. The unauthorized usage of the equipment or materials of the business in activities that will benefit the outside work of the employee. The usage of the time, where the employee is expected and paid to work for the company, to finish an output for the other business where the employee is also involved with. The unauthorized bringing of tools or other corporate properties outside the vicinity of the workplace so that these can be used for other purposes not related to the operations of the business. Establishing guidelines, restrictions, and prohibitions can make the employees take responsibility for their actions. If their outside work is already impacting the business negatively, then it is most likely that they are already aware of the consequences that they might face. Developing policies for outside work can ensure employees that there is an objective and fair treatment when it comes to assessing their employment cases. There are proper steps and procedures that should be linked to the strict outside work policy so that the management can address issues accordingly. Having a strict outside work policy can make it easier for the employees to decide on whether to leave the company or stay in exchange for the loss of their outside work. This may only occur if the employee cannot perform efficiently anymore due to the demands of the jobs that he or she is currently juggling at the same time. 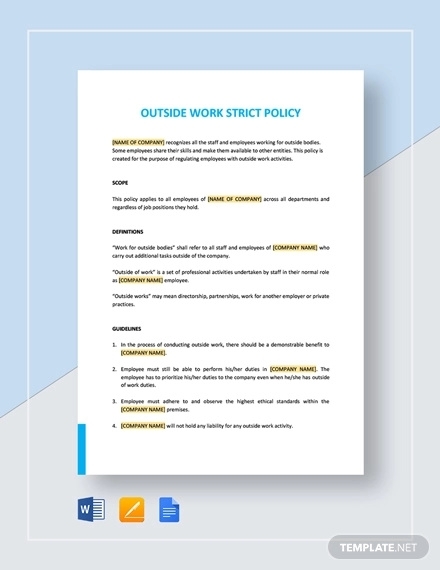 If you are already in the process of making a strict policy for outside work, you have to be aware that the main purpose of the document is to regulate the activities of your employees which can actually affect the business. While preparing this, you have to consult professionals as you should not interfere with the personal lives of your employees especially with other activities that are not related to your business and its operations. Always have legal counsels so you can ensure that you are following the law when making a strict policy for outside work. Be keen and careful when making this specific policy. It will be best if you will refer to the policies used by the businesses in the same industry. As long as you think that outside work is already affecting the performance of your employees, then it is truly essential to strictly incorporate the policies of your business. Also, keep in mind that you have to be reasonable when developing strict policies to let your employees be secured that these policies are consistent, well-implemented, non-biased and follow the workplace discrimination statement of the business.